Our most popular gear oil, this is the preferred product in nearly all car and light truck differentials, both conventional and limited-slip. 75W90 is excellent for most racing applications. It contains a friction modifier which is recommended for limited-slip units. 75W90 Gear Oil can be used in many transmissions and transaxles; however, other Red Line lubricants have better frictional properties for rapid synchronization. 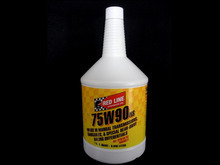 Suitable replacement for a differential calling for an 80W90 or SAE 90 gear oil. 100% synthetic racing lubricant based on Ester-Technology For all hypoid differentials with limited slip system, gearbox with integrated limited slip differential, mechanical transmission, synchronised or not synchronised gearboxes, transfer gearboxes. Super Pro bushings replace the Miata stock bushings, but at higher durometer levels to improve the handling balance with more precision. Energy Suspension urethane differential mounts stiffen up the rear end to prevent wheel hop on hard launches and also limit drivetrain rotation which can cause missed shifts.